This paper reviews the research on the dietary factors that impact one's resk for cardiovascular diesease. Information on blood lipids and other risk factors is included. It also reviews the data on reversing this disease via dietary means as well as looking at the impact of fitness and exercise. This paper reviews the research how factors such as calorie density, genetics, nutrient density, and exercise impacts weight gain and loss. It also includes a reiview of population studies and which foods predict weight gain and loss. A section on our gut biome and the role it can play is also included. This paper provides some step by step (or week by week) ideas on how to transition to eating a more plant based diet. It includes some recipe/meal ideas, strategies for eatng better while travelling as well as additional resources and book recommendations to help you on your journey. This papers reviews the research on how diet, exercise, sleep and stress impact brain function and brain health. It explores both day to day cognitive function as well as the research on preventing or slowing cognitive decline as we age. I am not a fan of using processed oils. So people often ask, "if I were to use an oil, which is the best one?" Here is a guide or summary of common oils and their pros and cons, so you can decide. Good sleep is one of the pillars of good health. This paper reviews the information on the health impacts associated with shortened sleep, the current state of sleep in leaders and research based strategies by which one can improve sleep quantity and quality. Regular physical activity is important for mental health, brain function, cardiovascular function, and staying young. This paper talks about the different aspects of fitness, energy systems, and how to design a well rounded fitness regime (even with limited time). For all things fitness, this is a must read. 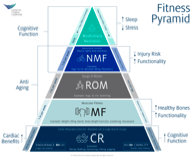 Here is a nice visual of the different types of fitness activities and why they are important incorporate. Click on it to download.